After our annual trip west to tease the elk (hunting them is perhaps too strong of a term, since our freezer has admitted no elk meat for several years), we took a small detour to look at elevators. I headed the car east onto Hwy 34 in Neb. after stopping to photograph the Grand Island, Neb. elevator, a Johnson Construction project. Like pearls on a string, grain elevators line up on Hwy 34 as it stretches from town to town west of Lincoln, Neb. From the look of the rounded headhouses on each elevator, Tillotson Construction Company of Omaha had free reign there during the construction years, having butted out potential competition as it changed the landscape on the old road. Only the York and Aurora elevators are recorded in the company construction record pages we have. I will present them more fully in a later post. The Murphy and Hampton elevators present a bit of a mystery. Since I had a full load of family cramped together in a rental car that was barely an SUV, more suited to a terrier dog and a bicycle than the five passengers it claimed to hold, I did not stop to investigate the mystery elevators. I had to be content with a few pictures taken on the fly. Here they are. I wonder if any of our readers remember these elevators, or can identify the builders? They will get another visit, hopefully soon, but for now, enjoy the photos. The concrete work is finished. You see those windows up there? The end of the headhouse is round because it’s hard to lay steel on a square corner. When you’re laying rebar, you have long straight sticks. Corners are hard to do. The is a Tillotson unique feature, as far as I know. It looks good because it matches the contours of the rest of the building. It was functional because the steel of the tank comes in about four pieces, and you lay them and they overlap. It was pretty exacting. You worked on your knees all night, up and down. You got the steel off the rack and you had to get down under neath and run it under all that stuff. And you did that over and over. The day that we were going to put the glass in the windows, those were steel-frame windows. There’s a little metal clip that holds the glass. You put the putty on the outside and you’re all done. The day we were doing that, the wind was blowing so hard, it was breaking the glass as we were put it in. We had to quit because of the danger of flying glass. They bought some different glass that was stronger, double-strength glass. It was just one of those things. All of a sudden, boom, this flying glass comes across the room at you. See the little cornice atop the tank? Those are forms for the cornice, the overhang. 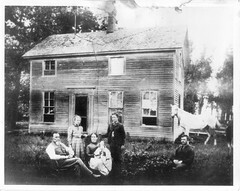 They call them eaves on a house. The roof was poured before the headhouse went up. That crane is a concrete-hoisting crane. The headhouse is quite an operation because you had to hoist the concrete up to the top of the tank. And then they had a deck crane, and you had to hoist it [the concrete] to the top. Every job I worked on, they used a nail keg that had been filled with concrete as a counterbalance weight. When you went up and down on the cable to go to work, that’s what you stood on—two guys, one foot each. That’s all there was room for. It didn’t take that long, about fifteen or twenty seconds. The motor and cable were down on the ground. The operator had a shed to keep him out of the rain and sun. At first glance, a water storage tank and a grain elevator seem to have a few things in common, both in function and appearance, though they present a number of differing engineering challenges. I had the opportunity to interview Joseph Carroll, a project superintendent for D N Tanks, while flying on a commercial airline to start one of my trips. When he realized the lady sitting next to him had some engineering background, and actually was interested in concrete construction methods, he warmed to his subject with enthusiasm. 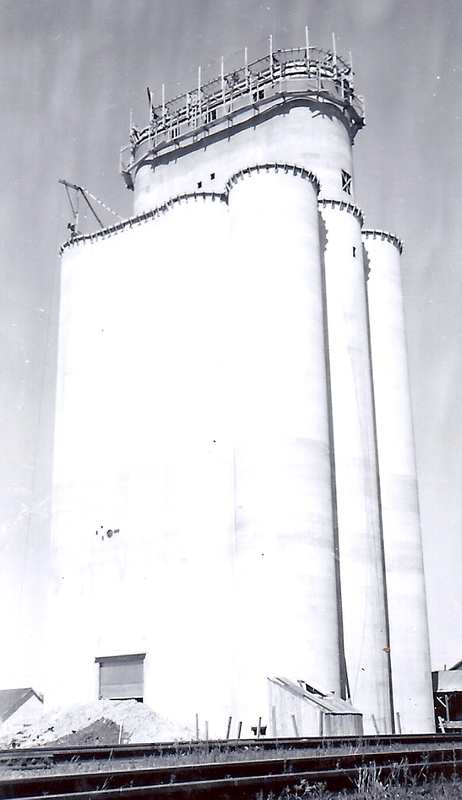 I wanted to find out how the construction of a tank answered the problems that grain elevator designs had to address–the management of stress (both vertical and lateral), the aging of the tank, interior access, wrecking out, weather considerations, and basic construction methods. D N Tanks had been in the business since 1949, and some of their tanks (still in service) were built before 1950. 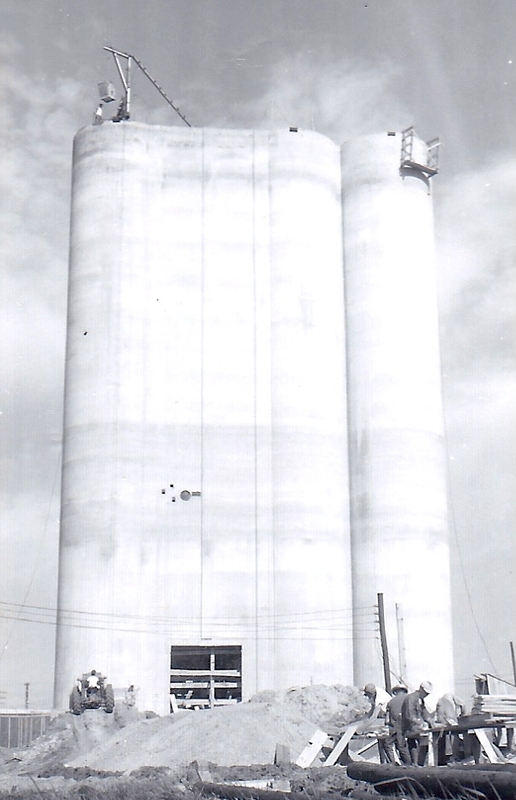 During the heyday of elevator building, when our grandfathers operated at the cutting edge of concrete design, water tank builders were innovating right alongside them. The types of problems they had to solve had common elements with those of elevator designers, but their solutions were widely divergent. After looking at our Tillotson construction specifications, Mr. Carroll commented that the design bearing load (the pressure of the water against the tank walls, expressed in pounds per square inch) of his tanks is about double the bearing load in a grain elevator. Elevator builders relied on a continuous concrete pour and steel reinforcement to provide the required strength. Obviously, something had to be done differently to build a water tank that would sustain that kind of load. D N Tanks, instead, builds tank panels which are poured in curved sections separately, then tensioned externally with wire winding as they are assembled on site. 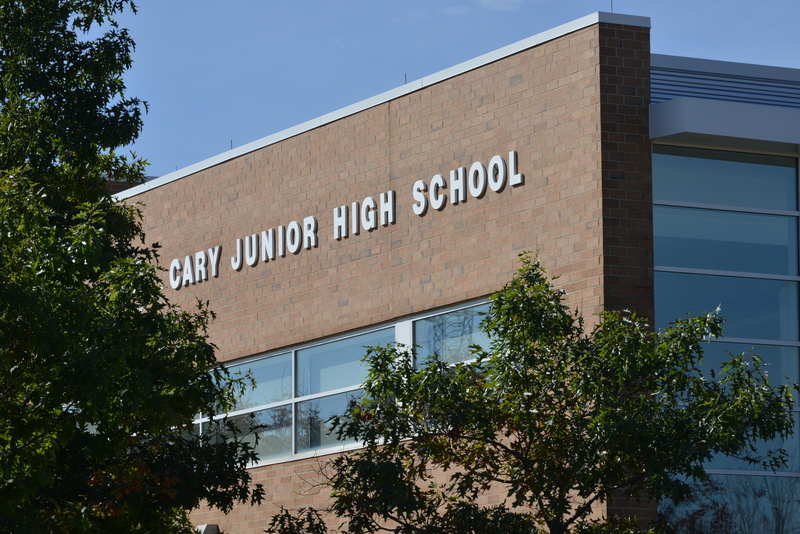 Cold weather also creates a design challenge for concrete construction. 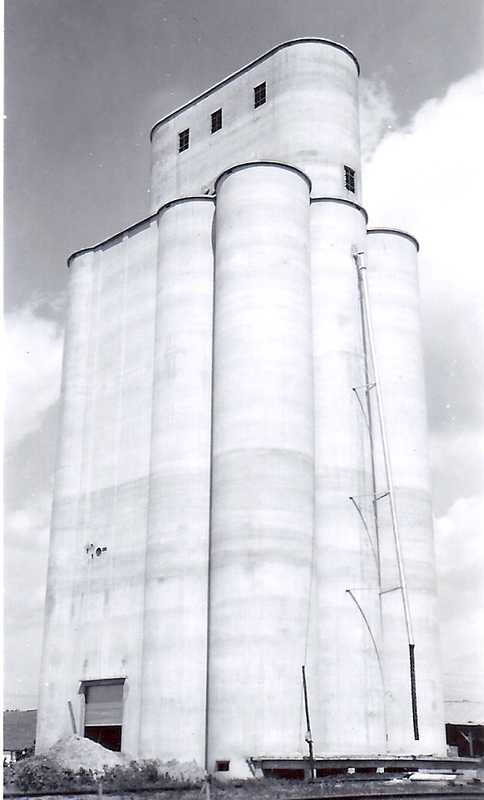 I mentioned that in Canada, wood construction for grain elevators was preferred, because rigid concrete could crack under differential heating–an elevator would experience freezing temperatures on one side and solar heating on the other. Water tanks require insulation to prevent freezing, though they can handle surface freezing to the depth of about six inches. The tank walls are built thicker, and an insulating material of styrofoam blankets the tank exterior for installations in Alaska and other northern locations. After the concrete roof is poured, wrecking-out is required (internal wooden concrete forms are removed). It is a process required for both elevator bins and tanks. Elevators retain the manholes used to remove the wrecking-out debris for later access to bin bottoms for cleaning. For water tanks, an access opening is left at the side to permit this process, but it is sealed afterwards. No access is needed from the side, because under normal use, the tank remains filled with water. Access to electrical systems for the pumps is from the top. Concrete elevators are subject to much more wear and tear than water tanks. 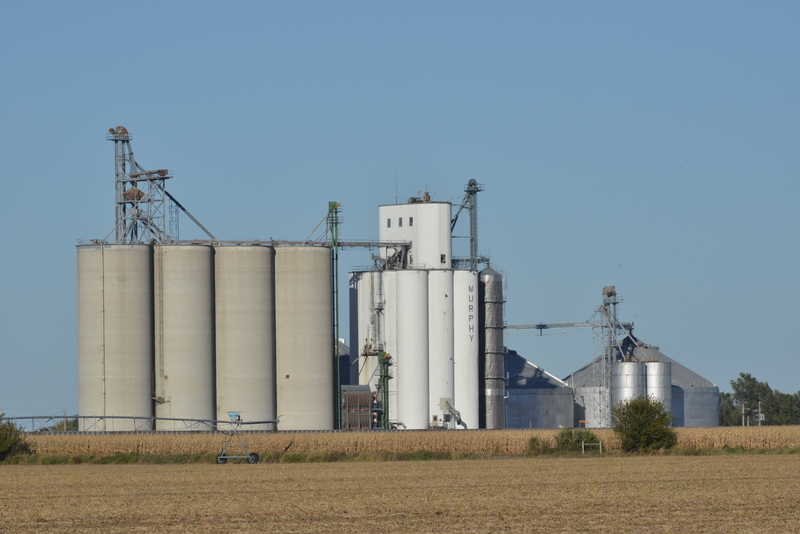 Internal friction is an issue with grain elevators: filling and emptying of grain bins abrades the inner concrete surfaces, eventually causing cracking and damage after many years. Tanks suffer from no such problems. 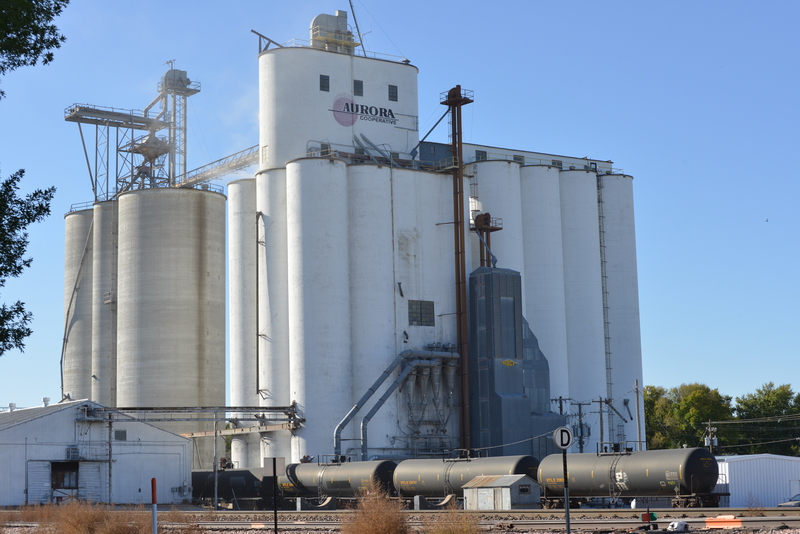 Fire is an ever present danger in grain elevators, and cleanliness is a constant battle. Tanks tend to be cleaner and safer, and if built correctly from the start, will long outlast the most robust grain elevator. 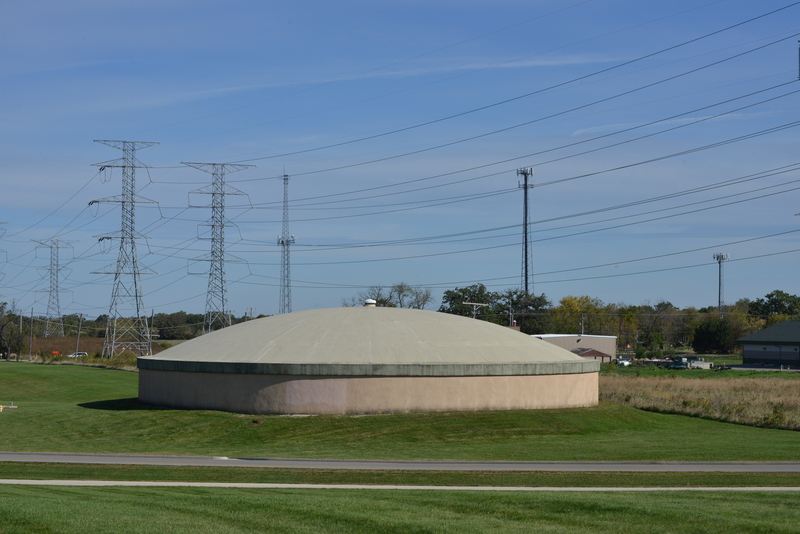 I happened upon one of these water storage facilities, built by D N Tanks, while attending my son’s football game at Cary Junior High School in northern Illinois. It appeared just as Mr. Carroll described as a typical D N Tank project: it was bordered with a two-foot wide lip, and topped with a white vent. The tanks are built in cities and towns to comply with a requirement for an emergency water supply. The tank or tanks must hold enough water to last for three days after normal municipal service is lost. 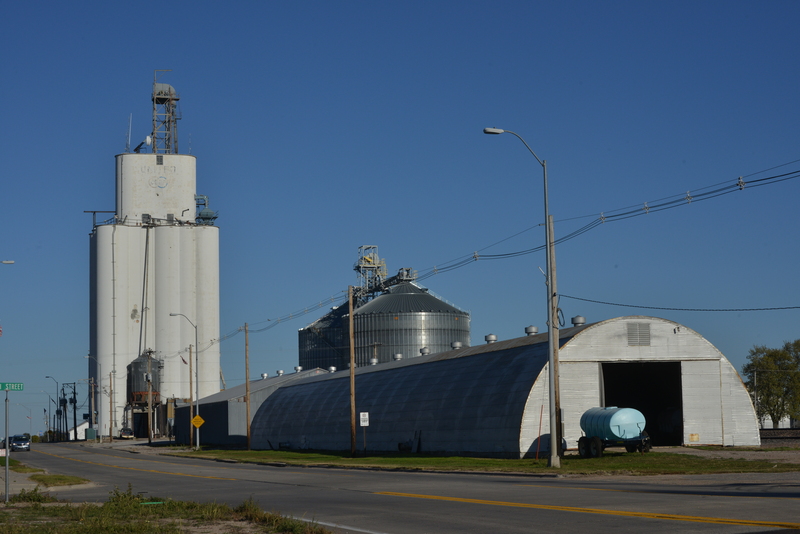 Unlike the many grain elevators that dot the Midwest, which rise to monumental heights, these tanks are designed to blend seamlessly into the community with as little visual impact as possible. The D N Tank website pictures a number of disguises, including architectural treatments, and fully underground construction. D N Tanks also produces tanks for glycol used for aircraft deicing, water treatment tanks, and various other tank types. It’s all done. It looks like they’re putting scaffolding up for painting. The main hoist is on the left. That’s a Georgia buggy hanging on the hoist. The guy that’s standing there is going to push it as soon as it hits the deck. They might be just starting on the headhouse. I can’t figure that scaffolding out. It’s a rigid scaffolding.